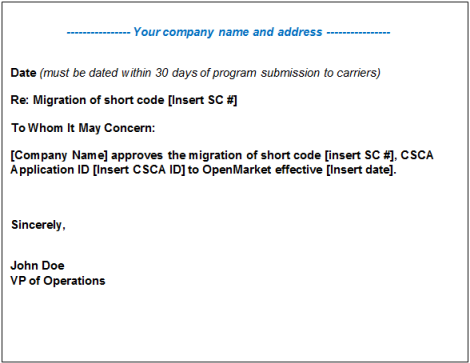 This document is intended for companies that wish to migrate a US short code to OpenMarket. Over the years we have migrated hundreds of short codes and our staff will work with you to ensure that your migration is a success. Migrating a short code is similar to provisioning one. The process takes about 4-5 weeks from the time OpenMarket files the program brief with the mobile operators. The time varies depending on the operator, type of program, and time of the year the program is filed. There are a couple of things to be aware of when migrating a short code. First, Sprint and T-Mobile follow a different process than the other mobile operators. Second, the integration and testing steps must be complete before mobile operators will migrate your short code. We help you complete the process by providing you with a live short code for testing, a dedicated account manager experienced in short code migrations, and access to our technical support engineers. To begin, contact your OpenMarket account manager or, if you do not have one, contact OpenMarket Sales (877.277.2801 or sales-us@openmarket.com). We will set you up with an account and a live short code for testing. This short code will work with all major US mobile operators. You can use the short code only for demonstration and testing purposes, not for commercial use (i.e., in conjunction with any publicly facing campaign, such as on a website or in an advertisement). The demo code’s ideal use is for application development, testing, and proof-of-concept projects. We will also ask for a contact email address to use to notify you when the actual short code migration happens with each mobile operator (step 4). Because migrations happen at different times depending on the operator, we utilize a tool to detect the shift and send you an email when it occurs. Once migration occurs you can begin routing your MT traffic through OpenMarket. We recommend that you remain connected to your current aggregator for the duration of the migration process. The objective of this step is to ensure that your application can successfully send MT messages and receive MO messages through the major US mobile operators. At a minimum you need to test all functionality on the Verizon Wireless, AT&T, Sprint and T-Mobile USA networks. You can use the OpenMarket short code since it is fully provisioned and live on these and other US mobile operators. Important: To minimize service disruption to your existing messaging program, complete integration testing before engaging with mobile operators. If you have any questions about test procedures or how to interpret error codes or verify results, we encourage you to utilize OpenMarket Support. They are available 24/7. You can open a ticket by emailing them at supporteam@openmarket.com, or by submitting a ticket online through Customer Center. When we submit your migration request to the mobile operators, we must also submit the three documents listed below. Use our Campaign Brief tool in Customer Center to provide us with these documents. Program-specific website — Your website must link to Terms and Conditions that are specific to your program brief. Your OpenMarket account manager can provide you with the details required for this URL, based on your specific program. For additional information about terms and conditions, see North America Messaging Content Requirements. Letter of migration — A statement written on your company letterhead saying that you authorize the migration of your short code to OpenMarket. The letter must be signed by a manager or executive (VP level or higher), and the company name must match the Content Provider of record in the CSCA system. When completed, use the Campaign Brief tool to attach a digital copy to your program brief. Contact your OpenMarket account manager if you need assistance. OpenMarket files the program brief (including the updated, compliant website), CSCA receipt, and Letter of Migration with each mobile operator. Each mobile operator conducts a review of your program. Once they review and approve the program, they proceed with the migration process. The process US mobile operators follow to migrate short codes varies. To ensure a smooth transition, your OpenMarket account manager will coordinate the migration of messaging traffic with each mobile operator. In most cases, you can tell when the migration has occurred because MOs will stop coming from your former aggregator and instead come from OpenMarket. To make it easy for you to recognize this shift, an OpenMarket system monitor (which detects MOs coming from each mobile operator) triggers an email notifying you of the migration. This operator does not notify us of a specific date/time of the transfer; instead they provide a two-week timeframe. You will be able to confirm that the transfer has been completed once you stop receiving MOs from your former aggregator and begin receiving them through OpenMarket. At this time you can begin routing your MT messages through OpenMarket. This operator completes short code migrations within a few days of OpenMarket submitting the request. You will be able to confirm that the transfer is complete once you begin to receive MOs through OpenMarket. At that time you can begin routing MT messages through OpenMarket. This operator schedules a conference call, inviting both OpenMarket and you to perform the transfer real-time. During the call, T-Mobile will perform testing, complete the transfer, and all parties on the call will verify that transfer has completed successfully. Once this happens, your MTs will be rejected by your former aggregator and can only be routed through OpenMarket. Note that on the call, T-Mobile will expect to test HELP commands. This operator schedules the migration to occur at a specific date/time, which will be provided to you in advance. At the appointed time, which will be 12:01 am CST, you will need to transition the routing of your Sprint MTs from your former aggregator connection to your OpenMarket connection. Once the Sprint transfer is complete, MOs will stop coming from your former aggregator and will begin coming from OpenMarket. MTs will then be rejected by your former aggregator and can only be routed through OpenMarket. These operators automatically migrate programs within approximately a week of receiving the request. Once you observe MOs coming through your OpenMarket connection, you are safe to begin sending your MTs through OpenMarket.